Geagea is the executive chairman of the Lebanese Forces, the second largest Christian political party in Lebanon, while Aoun is the founder of the Free Patriotic Movement, the country’s largest Christian political party. News website Now Lebanon described  the endorsement as a “political bombshell”, but not everyone was surprised by Geagea's decision. ‘Moulahazat’ blogger Ramez Dagher wrote a long post  analyzing what he called ‘the Christian wedding’ from a strategic point of view. In fact, Dagher wrote an article called “when warlords become presidential candidates ” nearly two years ago saying that “the candidates [for the presidency] are of the civil war era, their programs are of the civil war era, the parties are of the civil war era, the lawmakers are of the civil war era, the absence of parliamentary elections is of the civil war era, and even our former overlord to the East is in a civil war.” In other words, for those of us who have grown cynical towards Lebanese politics, that one former warlord decided to endorse another former warlord didn't really come as a shock. As for the reaction of the public, it's hard to say. Despite an anonymous minister claiming in an interview with  Al Monitor that “more than 85% of the Christian public opinion is now with Michel Aoun”, the news of Geagea’s endorsement of Aoun proved to be controversial to say the least. With memes, tweets, songs and jokes, the Lebanese internet exploded with disbelief, outrage, or just plain old sarcasm. The point of this post is to simply document memories. The Lebanese Civil War was a complex 15-year-long series of events and no one article can properly encompass its complexity. Since Samir Geagea and Michel Aoun are currently making the news in Lebanon, we have focused our efforts on the Lebanese who talked about these two men’s actions during the war. There will be other stories, stories of the disappeared and of current warlords-turned-politicians, of the fallen and the survivors. Maya Mikdashi: We were just lucky! The first story is by Jadaliyya co-editor Maya Mikdashi, who wrote in an article entitled “Let us now praise murderous men ” about the trauma caused not only by Geagea and Aoun, but by other leading politicians currently in the Lebanese government. The second story  is by Wadad Halwani, whose husband, a member of the Communist Action Organization, was kidnapped in 1982. Halwani is now the chairperson of the “Families of the Disappeared and Abducted Committee”. In an interview  with Lebanese Francophone newspaper L’Orient Le Jour, she explained why she keeps on fighting for the cause of the disappeared: “I have a new responsibility today, which is to look out for some 17,000 officially reported abducted persons,” adding that she will never give up until her mission is completed. When they fought, they fought us and on our account. When they reconciled, they made up without us and at our expense. This is their way, not just now, but from the beginning of the civil war in Lebanon in 1975, until its end, and continues until today. This attitude is not confined to Aoun and Geagea but includes all the leaders of militias and parties which went to war which resulted in tens of thousands of deaths and injuries in addition to those who became disabled, disappeared and were forced to immigrate, in addition to the destruction that effected all aspects of life in Lebanon. And we, the people of this country, continue to suffer the effects of that war until today, across all levels. And those warlords continue to live and move freely among us. They are still in charge of all aspects of this country and over all the people with the jungle mentality they has during the war. They have not changed in times of peace. It is strange that people until now support this candidate or that! Sorry, I might be hallucinating. I remember every rocket that flew above my brother's and my heads during the war of elimination. I remember my father's screams when he broke his leg and we couldn't take him to the hospital because of the falling mortar. I remember my neighbour's complaints about the humiliation she suffered every time she had to cross the Barbara checkpoint. I remember how my father forbade us to say that he loved Aoun in front of our neighbour who fought with the Lebanese Forces because of his fear on us. I also remember the note put up by my grandmother in the kitchen: “Discussing Politics is Forbidden” as she tried to put an end to the quarrels over Sunday lunch (this was after 2005). I remember the people who shot at and hit each other in 2007, when the Aoun's supporters decided to block the streets and burn tyres. I remember the incitement, insults and accusation campaigns that started on the television screen and ended up in the living room. I remember the hope among people after Aoun visited Geagea in prison and how everything turned south afterwards. Geagea's nomination of Aoun would only be genuine and a chance to turn a new page if only they would apologise for their barbarian wars. They will have to apologise to everyone who lost a family member because of their constant fighting. They should apologise to the families that have become divided because of their enmity to this day. They should apologise and set the ground for a real reconciliation between the people, and not just a reconciliation between the leaders and sectarian officials to fulfill their political goals. They should apologise for those 30 years of our lives! They should apologise. Rouwa Saba: This big lie will not give me a happy childhood! At the time, we used to live in a place called Haboub, in Jubeil. At the time, we were forced to stay in the dark every night, even if there was electricity. Candles were expensive. If we lighted one even to look for something, the price could have been a rocket or a bomb. At the time, Aoun supporters were under our windows, and the Forces were on the rooftops, so you could just imagine the fighting that took place between them, while we were stuck in the middle. At the time, my father used to sit on the kitchen floor, and resting his head on the fridge, before my brother and I would run to him and he would embrace us, and that is how we would spend the night. He would make up stories to keep us occupied from the sounds of mortars and bullets. At the time, we had no bread. We would go to sleep hungry. I can never forget when my mother came down the stairs. It was the most I have been afraid. She was an easy target for both sides. I ran behind her thinking if they snipe her, they would hit me and not her, and my brother ran behind me and my father behind him. It was our last day in the house. They blew it up. And the stairways disappeared. And the windows which prevented us from having candle light were gone too. But we survived. That's what my mother said. At the time, survival from death was a luxury. At the time, until my family was able to secure another house for us, the Forces hid my brother and I in a tank, not because they were good, but because we had contacts. My uncle was in the special unit of the Lebanese Forces. I will never forget that day. The sounds on the wireless, speaking about operations, and then the intensifying of the fighting, and the bullets, and bombs and mortar. 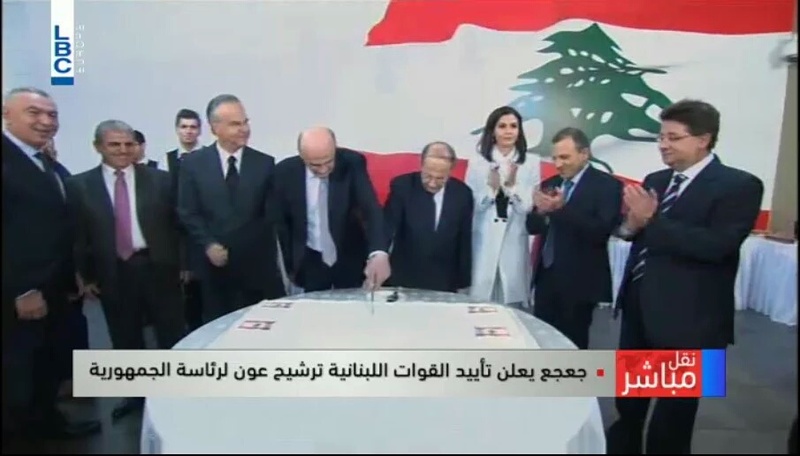 These are all scene I will never forget even if Aoun and Geagea met yesterday! Even if they kissed each other yesterday! Even if they signed an agreement of understanding between each other yesterday and even if they said they have learned lessons from the past to enable them build the future. Those who think of war never put peace among their priorities. That was an ugly childhood, ugly because of Aoun and Geagea. A big lie will not give me a happy childhood and make me forget the sounds of bullets and bombs that I grew up hearing. Before you reach an agreement, you should apologise from me and from all the families that you have made flee, and destroyed their homes, and killed their members. Before you smile and joke with each other, you are forced to apologise because you were responsible for destroying entire lives. And congratulations on your reconciliation, you deserve each other. People like you two, only suit each other. Congratulations on the republic of garbage and sewerage. To hell with you and your republic! Abir Ghattas: I demand better! Finally, this last story  is by Abir Ghattas, co-author of this article. Being too young at the time, she doesn’t recall the war itself but rather asks what is next for those of us who were born at the end or after the civil war.